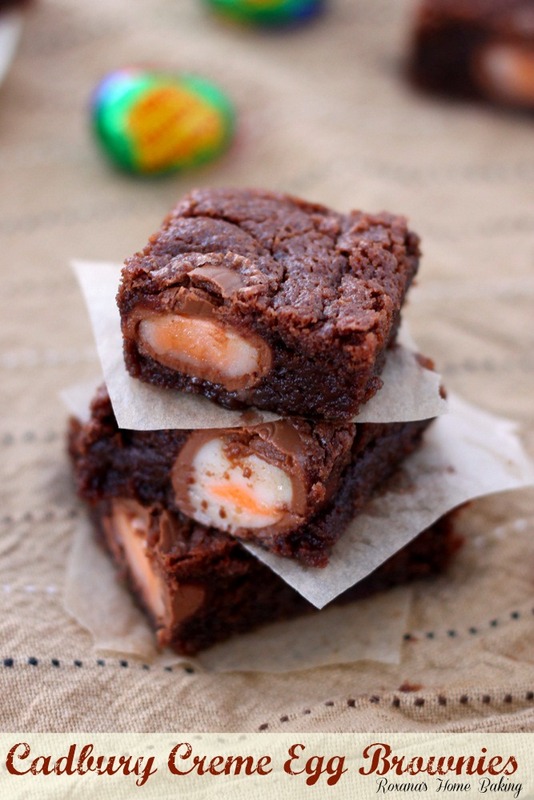 Rich, fudgy and totally addictive, these Cadbury creme eggs brownies will be the first to disappear from your Easter table. The ultimate Easter dessert! There’s a new movie coming up this Easter season. Very similar with Charlie and the Chocolate Factory only this one is called Roxana and the Cadbury Creme Eggs Factory. If I have to pick one candy I’m most looking forward to Easter it’s definitely the Cadbury Creme Eggs. I love the creaminess inside the chocolate shell. I wish they make this ginormous egg so I can eat the filling with the spoon and call it dinner. 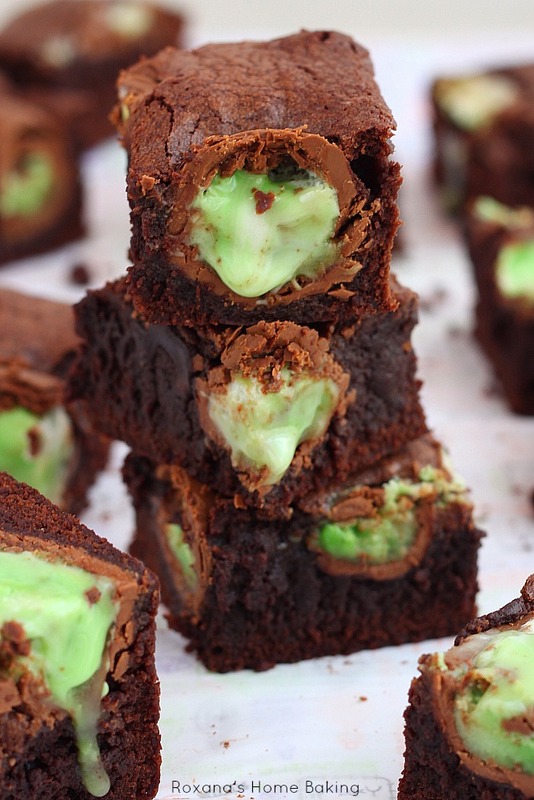 Wrap around the creme eggs rich, fudgy brownie batter. Oh, yes! I did it! And let me tell you, way better than eating the eggs all by themselves. Bake, let cool and enjoy. It’s that simple! The results are out of this world good. The outside forms a thin hard shell, the best part of the brownie if you ask me, and the inside is fudgy and totally addictive. The Cadbury eggs soften but still hold their shape. 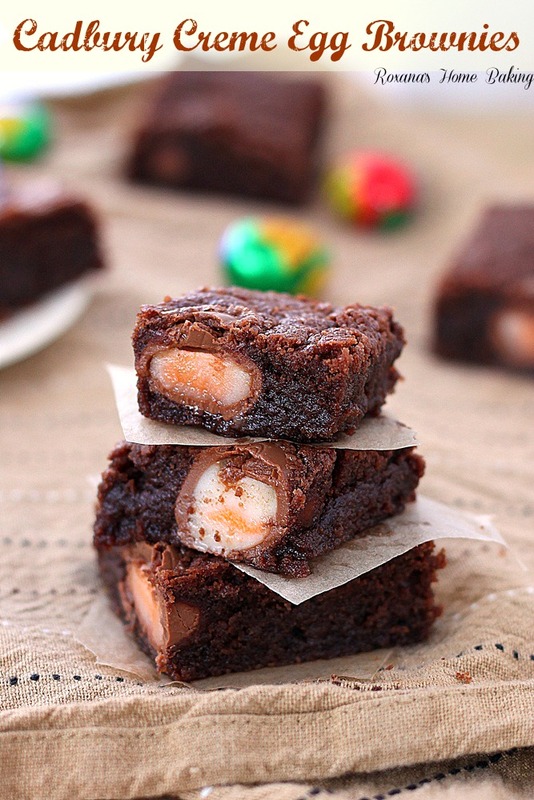 Rich, fudgy, irresistible and totally addictive brownies with Cadbury Creme Eggs baked inside. 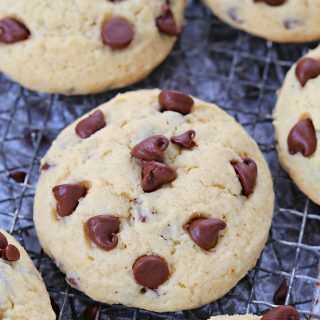 Melt the chocolate chips in a microwave self bowl or double boiler. Stir until smooth and combined. In a mixing bowl, with the paddle attachment on, cream the butter and brown sugar until light and fluffy, about 2 minutes. With the mixer on low speed, pour in the melted chocolate. Spread the batter on the bottom of the prepared pan and press in the the Cadbury creme eggs. I love love love the caramel Cadbury eggs...I'm going to try this recipe with those too!! Thank you for the great idea! So nice to see you at Valerie's blog today! 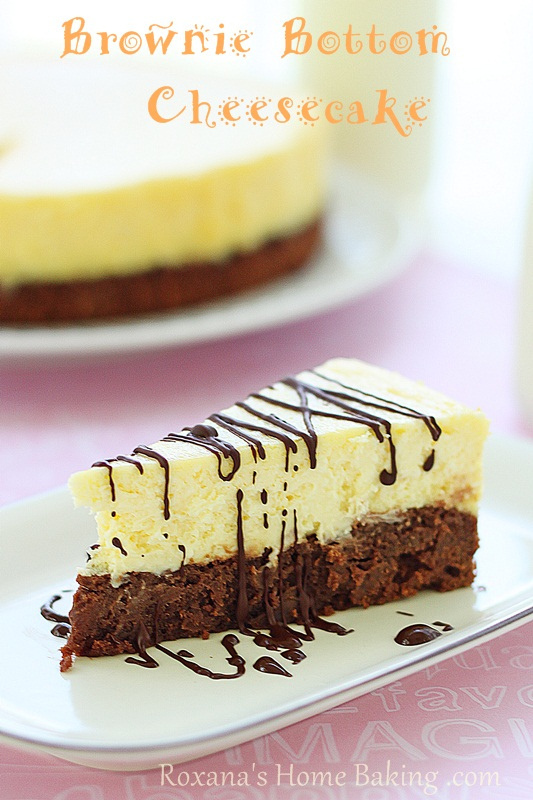 :) These brownies look incredible...I think I need a few right now for a morning chocolate fix! I loooooooove Cadbury cream eggs in anything! When I was little - I used to sneak into my parent's closet and sneak a few Cadbury Eggs (meant for my Easter basket). Of course they knew - but if they confronted me, I would pull out the Easter bunny card and start crying. (I was a wicked child). 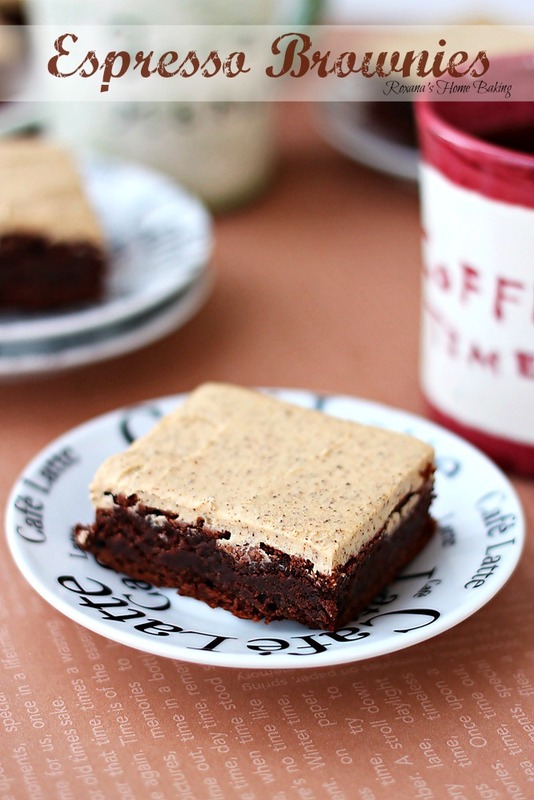 :D So happy to have these delicious brownies on my site today!! 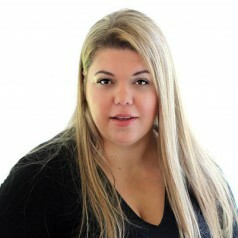 Thanks, Roxana! thank you! i baked these today but for me the eggs did not hold their shape inside the brownies...instead they floated up to the top and all of the creme came seeping out. i baked them for less than 30 minutes at 350 so i'm not sure what i did wrong! they still tasted delicious, though! My best childhood friend just loves cadbury creme eggs. I never had one till I met her! 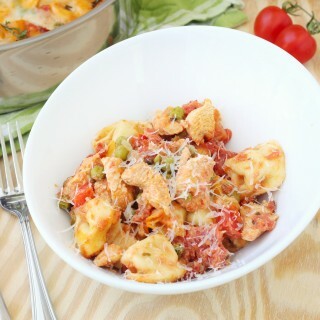 These look just delicious (no surprise) and I can't wait to try the recipe. Thank you for sharing. I hope you have a bright and happy weekend! This looks amazing! I'm a huge fan of Cadbury eggs! OMG! I've been obsessed with Cadbury Creme Eggs since I was a kid. This looks amazing! 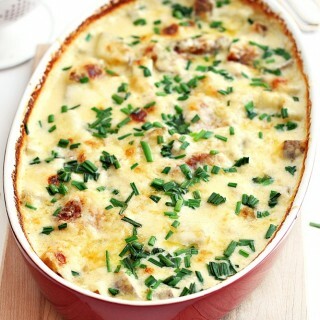 Hi , I have tried this twice now the end result amazing ... but My eggs cook in the middle they do not stay white and creamy like yours .. they are brown and fudgy. I have tried bringing it out sooner, covering them first with brownie mix .. what am I doing wrong?? Oh my gosh! 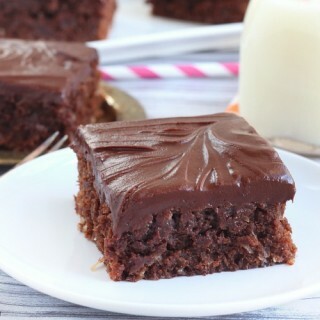 That brownies looks so moist! I can't stop thinking about these! They look so fudgy and wonderful...I saw them on Valerie's blog and had to come say hi to the mastermind behind them :) Thanks so much for stopping by my blog too! Looking forward to following you. 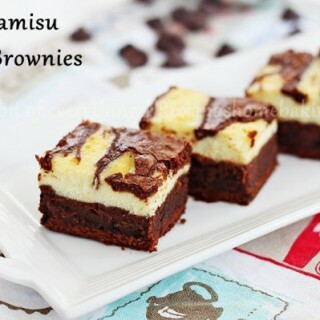 Oh wow I love this idea, your brownies look divine! Hi! I'm late to the party here but I wanted to try making these. 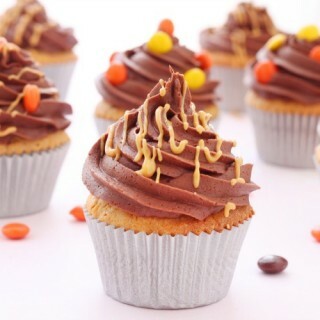 Was just curious in the picture it looks like regular sized cream eggs were used but the recipe calls for mini ones?? Is here a reason for that? Hi Christine, The brownies are not think enough to hide a regular size Cadbury egg inside, that's why the recipe calls for mini eggs. 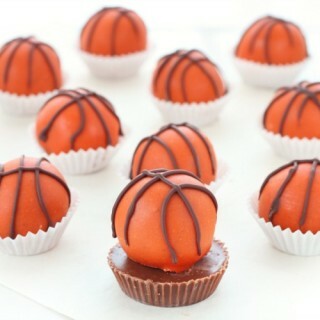 I bet these are out of this world good! They look incredible, my friend! i'm planning to make these but i'm hoping these same measurements will be OK for my 9 x 13 inch pan? or should i do 1.5x the measurements? thanks!! I doubled the recipe and made it in a 13x9 inch pan. I used 3 packets of 12 eggs. I was kind of disappointed with how it turned out. When you bite into an egg, it doesn't have the 'goo' inside it anymore, like it does in your photo. So it just tastes like a piece of chocolate in a brownie and sometimes you get a chewy bite where the goo had melted into the brownie batter. It would have been better just to eat the $9 of eggs! I'm sorry to hear you had problems with this recipe. Did you follow the recipe or make other adaptations? 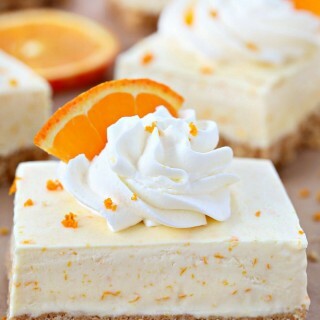 These looks seriously delicious! I love creme eggs, this year I made a creme egg trifle!